One way or another, India keeps on finding the ways to win matches. They continued their good form and won the 2nd ODI vs New Zealand at the Bay Oval. Indian skipper Virat Kohli won the toss and chose to bat first. Shikhar Dhawan and Rohit Sharma gave India a great start by completing their fifties. They put on a century stand after 10 ODIs. 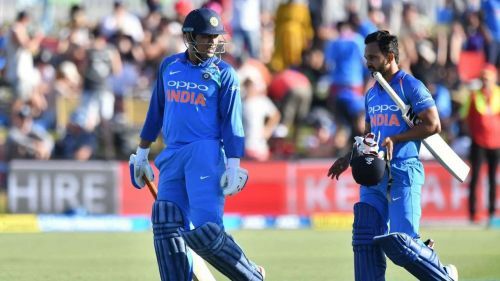 Contributions from Kohli, Ambati Rayudu, MS Dhoni and a cameo in death overs by Kedar Jadhav propelled India to 324, which turned out to be a good score. In reply, New Zealand never really looked like chasing the score. Most of their batsmen got the starts but perished to the spin of Kuldeep before making a significant contribution. Some late quality batting by Doug Bracewell was the saving grace for them, otherwise, they never looked comfortable in the pursuit of the target. India took a 2-0 lead in the series. Here are the player ratings for the 2nd ODI. Shikhar Dhawan scored his first half-century in 9 innings in the first ODI and got back to form. He continued his good form here by scoring a very good half-century. He looked fluent right from the start. However, he will feel he missed out on a hundred here. Rohit took his time as he does so often but once he got into his groove, he looked in total control. He played some delightful strokes throughout his innings. He looked well set for another big innings but got before completing his first ever hundred in New Zealand. Kohli batted really well for his 43. He rotated the strike from the moment he arrived at the crease and picked up occasional boundaries when he wanted to. 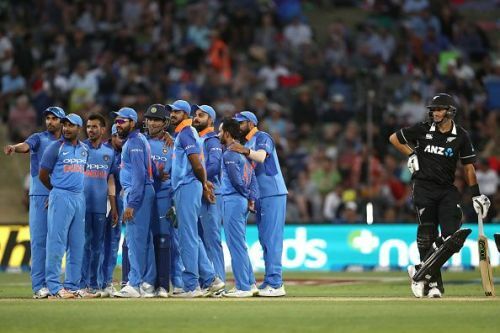 However, he was undone by a very good short ball by Trent Boult. He struggled for first few balls but started timing them well once he got the idea of the pace of the pitch. Rayudu played some delightful strokes but struggled to up the ante in the last stage of his innings. He rotated the strike very well right from the start and found the gaps successfully when he wanted to. He was middling the ball very well. He seems to be getting better with the bat as he plays more and more. Kedar Jadhav played a wonderful cameo coming at the crease when there were only a handful of deliveries left and made full use of them. He picked his spots to score runs quickly. Additionally, he bowled beautifully and did his job to perfection. Vijay Shankar couldn’t get the chance to bat but he bowled a couple of overs. He constantly missed his length and was a bit expensive. Bhuvneshwar was much more consistent than the last match in terms of his line and length. He bowled with very good control except for an odd ball on Colin Munro’s pad. He took the important wickets of Martin Guptill and Bracewell. Shami bowled way better than his figures suggest. After going an absolutely expensive over bowling to Kane Williamson and going for 20 runs in it, he came back by taking the big wicket of Kane in that very over. He then bowled with good pace and control in his second spell. It was another fantastic performance by Kuldeep today. Like he does every time, Kuldeep bowled slow, flighted the ball and got it to turn. He constantly troubled the batsmen not only with his turn but the intelligent change in his lines and lengths. He foxed the batters completely. He was a bit expensive in his last couple of overs but overall it was a beautiful display of spin bowling. Chahal started off very well today. He bowled slow and got a bit of turn. He got Colin Munro's important wicket. He ended up being a bit expensive after that because Bracewell handled him very well.